This isn't the iPhone 5. No matter how badly you wanted something slim, sleek and wedge-shaped, this isn't it. If you went ahead and got your hopes up ahead of Apple's "Let's Talk iPhone" event, hopefully you've gotten over the pangs of discontent by now, because this device pictured front and center is the iPhone 4S. It's a new spin on an old phone that will shock none, but give it half a chance, and it will still impress. The iPhone 4S comes with a faster processor, a better camera, a smarter virtual assistant and twice the storage of its predecessor -- if you don't mind paying for it. Like the iPhone 3GS did before to the 3G, the 4S bumps the iPhone 4 down to second-class status, leaving those Apple fans who must have the best aspiring to own its decidedly familiar exterior. Apple says this is the most amazing iPhone ever. Is it? Yes, of course it is, but read on to see whether it's really worth an upgrade. Apple clearly has a winner with its best iPhone to date, but if you were gunning for the iPhone 5, you'll be best continuing the wait. How would you rate the iPhone 4s? 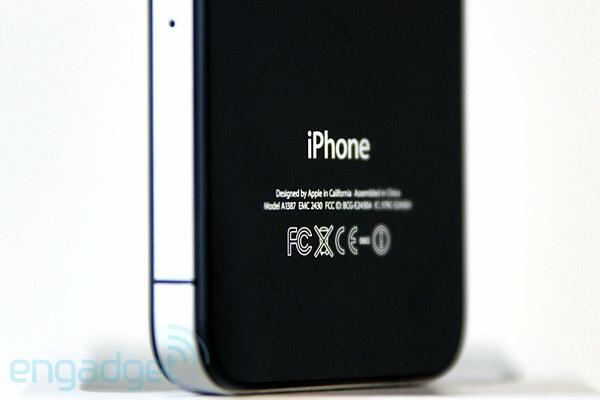 Familiar is a good term for the exterior of the iPhone 4S. When the 4 was unveiled in the summer of 2010 it was a strikingly different design from anything else on the market -- glass on the front and back, exposed screws holding together a deliciously clean ring of stainless steel. It was kind of chunky and industrial, like a tastefully refinished factory loft -- a big contrast to the smooth and nondescript models that came before. The iPhone 4 was something truly new and, for the days and weeks after its release, just spotting one in the wild caused a sensation. It was so different that people wanted to touch and hold the thing, to see how it felt in the hand. Few are going to go out of their way to touch and hold the iPhone 4S, but that's not to say it isn't very nice to grasp. The iPhone 4 felt like a finely crafted piece of machinery and there's no doubt this one walks in those very same footsteps. Compared to your average modern Android wunderphone the 4S feels small, dense and heavy, a very different sensation than the occasionally lighter but frequently more plasticky competition. The 4S does actually have slightly more heft than the 4, but only by carefully holding one in each hand can you notice the increase from 137 grams (4.83 ounces) to 140 (4.94 ounces). Save for a few tweaks that even the most dedicated Appleista wouldn't be able to spot at a distance, the 4S is identical from the exterior. A few of the controls have been shifted by fractions of a millimeter and this uses the same exterior antenna layout as the CDMA iPhone 4 that hit Verizon earlier this year. Rather more significantly, though, how it works with those antennas has changed. 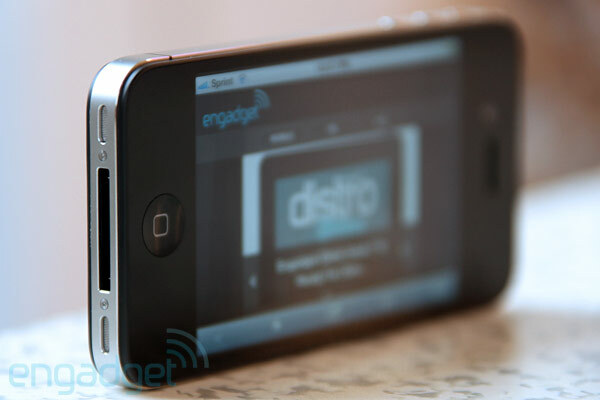 The iPhone 4S can now intelligently and instantly switch between those exterior antennas, in real-time, even while you're in the middle of a call. Will this successfully put to rest the iPhone's reputation as a call dropper? That we're not able to say conclusively at this time, as you really need masses of people hammering on a device to bring out its worst. ("Antennagate" didn't come to light until a few days after the iPhone 4's release.) But, in testing a Vodafone 4S against a 4 we found the 4S to be consistently one bar higher, and did a far better job of holding on to 3G data. Here in the States, our Sprint 4S kept right up with another device we had handy from the same carrier: the Nexus S 4G. There have been a fair number of other tweaks on the inside. In fact it's safe to say Apple threw out the lot of the iPhone 4's guts and stuffed in a whole new batch, starting with the A5 processor. Yes, it's the same dual-core chip that powers the iPad 2 and, while Apple isn't saying, it's running at 800MHz -- a bit of a step down from the 1GHz it's clocked at in the tablet. RAM unfortunately stays the same, at 512MB, but maximum available storage has doubled, matching the iPod touch by maxing out at 64GB. The other major change to the internals comes in the wireless network support. This is a quadband UMTS / HSDPA / HSUPA (850, 900, 1,900, 2,100MHz) and quad-band GSM / EDGE (850, 900, 1,800, 1,900MHZ) device, while also offering dual-band CDMA EV-DO Rev. A (900, 1,900MHz). All that naturally means you'll be getting 3G data on nearly every carrier in these lands and abroad, though those providers are still being cagey about just how much success you'll have at porting the 4S from one to another -- at least until the unlocked model shows up in November. There's no 4G on offer, though AT&T's 14.4Mbps HSPA+ service will leave you feeling a bit less out of touch. Up front is the same 3.5-inch, 960 x 640 Retina display that wowed us 16 months ago on the iPhone 4. That 326ppi density is still quite a lovely thing to behold, surely one of the highest quality panels currently available today in a phone, but in nearly a year and a half the world has moved on. Smartphones are bigger than they were in 2010 and 3.5-inches seems on the small side of average. It's a great size for those with moderately proportioned hands, and opinions certainly differ when determining what is the optimal girth for a smartphone (if, indeed, there is such a thing as optimal) but, after living with a 4.2-inch or larger device, looking at the digital world through a 3.5-inch portal feels just a bit... narrow. 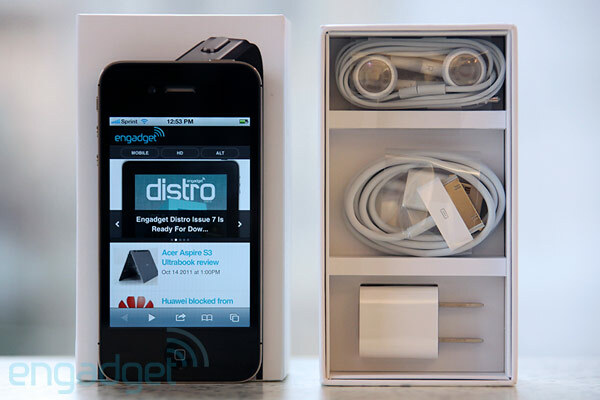 Though it comes a few days after its release, the iPhone 4S ushers in the world of iOS 5. This latest revision of Apple's mobile operating system helps to clean some of the dust off of what was starting to feel a bit dated without actually changing any fundamentals. iOS 5 introduces a slew of improvements and enhancements, some minor and some rather more major. We've already posted a particularly comprehensive iOS 5 review, so we won't blather on about it any longer here except to say it's a very solid update that will make your smartphone an even more seamless, integral part of your life. The one thing we will blather on about quite a bit more here is Siri, your own digital helper. 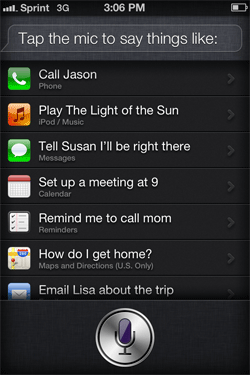 Siri is an evolution of the Siri Virtual Assistant, a spin-off of a DARPA project called CALO. Apple bought the company in early 2010 and now that functionality is baked right into the OS. Sort of. 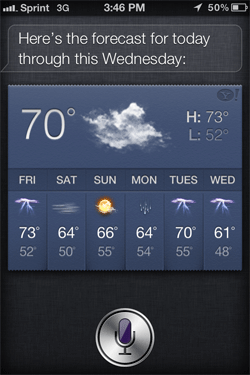 Siri can only be found on the iPhone 4S, a curious and seemingly arbitrary shunning of the other iOS devices. We've heard that's due to the processor demands required for voice recognition, but since you need an active data connection to use Siri we have to imagine that the heavy lifting for voice recognition is happening somewhere inside Apple's massive data center, which would seemingly allow lower-spec devices to do the same. And, since the iPad 2 is running the A5 at an even higher clock speed, there's just no good reason we can think of for putting Siri exclusively on the 4S. Let the poor girl out, we say. Should you find yourself owning the requisite hardware to give Siri a shot, you'll probably be pretty impressed with what she can do. Of course, "she" is a characteristic bit of anthropomorphism that we'll apply to the same voice you've probably heard in a half-dozen GPS devices in the past, but still, calling her an "it" just seems a little wrong. Siri herself, though, wouldn't mind. Ask her "Are you a man or a woman?" and her response is a curt "I was not assigned a gender." We think she's just playing hard to get. Siri can do a huge number of things, from sending texts and emails to finding restaurants and getting directions from one place to another -- things that, it must be said, could largely be done before by voice on other devices and platforms. It's really the enhanced ability to understand casually spoken English mixed in with the notion of context that sets this apart. Let's talk about the context bit first. Say you want to send a text to your wife to remind her to pick up the dogs from boarding on the way home from work. You can just say, "Tell my wife don't forget the dogs." Siri will send your wife a message saying, "Don't forget the dogs." How does Siri know who your wife is? Well, she doesn't at first, but she'll ask, and once you tell her she'll remember -- until the end of time. That context works in other situations, too, like receiving a text message from someone, asking Siri to check your calendar, and then just saying "Reply, I'll see you then." You don't need to say who to reply to, Siri will remember. For the first time we feel less like we're giving stiff commands to a device and more like we're actually having a conversation. That said, you can still be as commanding as you like. Siri won't mind. And then there's the other part that makes Siri good: you don't have to remember the commands. At least, not as much as you do with Android. If you want directions on Google Navigation you have to specifically say "Directions to X." 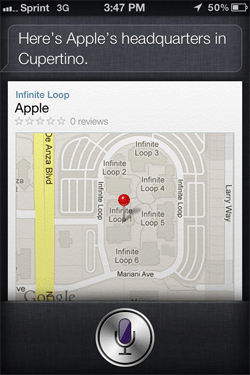 With Siri you can say "Get me directions to X," or you can say "Tell me how to get to X," or even "Directions to X." It's a minor difference but it feels more like Siri is smart enough to figure out what you want, whereas the voice recognition elsewhere feels more like you have to be smart enough to remember to say what it wants. (Even so, we'd certainly prefer to use the far more polished Google Navigation than IOS's Maps to get around.) Still, this isn't exactly unprecedented, apps like Vlingo do similar things elsewhere. Also, it should be noted that Siri isn't necessarily any more accurate than other offerings. We did a side-by-side comparison of the dictation abilities of iOS 5 vs. those built into Android and Windows Phone and found them to be similar. Android's dictation services, though rather less friendly than Siri and requiring a few more taps on the display, were every bit as accurate. Windows Phone, however, struggled to provide consistently accurate transcriptions, often missing words and getting more complex statements wrong. For example, the spoken text "Kurt Vonnegut lived near Schenectady, New York," one time resulted in the message "Could I get laid in your Schenectady New York." An interesting message that Mr. Vonnegut would have likely approved, but wasn't exactly what we had in mind. It's in going the other way that Siri has even more potential, saying that you have a new message and then promptly reading it to you -- then letting you reply by voice. The biggest issue here, though, is that you can't have emails read to you, which means you can't fully reply by voice. (You can do voice dictation, but you'll need to trigger that with your fingers.) This potentially could be a boon for people who would rather listen to their inbox than NPR on the commute home from work, and indeed it is, but the functionality here is a little more limited than we'd like. For example, you can tell Siri to look up something on Wolfram Alpha, and that she'll dutifully do, but she won't read you the response. You have to look at the phone, likely thanks to Wolfram Alpha rendering its results as images rather than plain text. A truly good assistant will look up whatever you ask and promptly tell you the answer -- not print it out and make you read it. Having to still fish your phone out of your pocket for some things makes Siri rather less wonderful than she could be, but she's very impressive nevertheless. And, more importantly, this signals that Apple is taking a real interest in improving voice recognition and hands-free device interaction. That should mean some amazing progress from here, and we can't wait to talk to the next generation Siri. We also hope that Siri's siblings will be able to run offline, because today's girl requires a 3G or WiFi connection to do anything. Even the simple voice commands that were available in iOS before no longer work offline, and if you happen to be one of the few who actually used those commands to change tunes while offline, you're sadly going to have to find another way. We also hope that she broadens her horizons a bit, as much of Siri's functionality (directions, looking up businesses) doesn't work in Europe. But it's not all about the benchmarks, and we've been overall quite impressed by the performance of the 4S in general tasks. We remain continually impressed by the performance of the iPhone 4 -- despite its aging assets, it still performs like a young smartphone in its prime. In other words, we're not seeing a particularly strong difference between day-to-day usage of the two devices. Yes, your apps will load a little more quickly and react more responsively and your webpages will render more snappily, but Apple already did such a good job of ensuring solid performance on the 4 that this upgrade seems rather less than necessary. Of course, that could all change when we start to see some games able to make use of the extra firepower the iPhone 4S has at its disposal. At the phone's coming out party Epic showed off Infinity Blade 2 and wowed us with very impressive graphics. The problem is, that game isn't due out until December, and we're not aware of other similarly eye-popping 4S-exclusive titles in the pipeline that will be dropping before then. The final aspect of performance is network speed and, as ever, your mileage can and will vary greatly depending on the relative strength or weakness of carriers in your area. But, regardless of carrier, the lack of LTE here is a definite disappointment. Top-tier phones on Android almost universally feature a fourth gee and, with Verizon, Sprint, and AT&T all finally onboard the LTE train to 4G Town, it's about time the iPhone hitched a ride too. Its omission surely helps battery life but hurts this device's status as a world-conquering wunderphone. We tested a Sprint version of the phone and found that, with full bars on 3G, download speeds were averaging about 1Mbps down and .9Mbps up, with pings hovering around 70ms. Comparing that to a Nexus S 4G (with WiMAX disabled), also running on Sprint, we found download speeds to be quite comparable. Signal strength between the two phones was comparable as well. Apple is quite proud of the iPhone 4's status as the most popular camera on photo sharing sites like Flickr, and now the company is finally giving all those guerilla photogs something good to capture pictures with. As was long rumored, the iPhone 4S steps up to an eight megapixel, backside-illuminated sensor that sits behind a new lens array with an f/2.4 aperture (improved from the old phone's f/2.8). More megapixels certainly don't equate to better pictures, but it's safe to say the new camera package here impresses. But, what will impress you first is the speed. Apple is quite proud of the speed improvements for bringing up the camera app and taking the first picture, and it is a noticeable improvement over the 4 -- except when using the HDR mode that was introduced in iOS 4.1. Here it doesn't seem to be much if any quicker at all. Leave that off, though, and you'll be hopping from one shot to the next like someone who hasn't got time for shutter lag. In our initial camera testing, we put ourselves into tourist mode: walking around, taking random pictures of things that tourists would. The quality of the resulting shots is definitely good, among the top top tier of shooters we've tested. The phone doesn't seem to be bothered by big differences in contrast (like the Galaxy S II) and does a good job focusing quickly and accurately -- we only had one or two missed macro shots. Video quality is also top-notch. 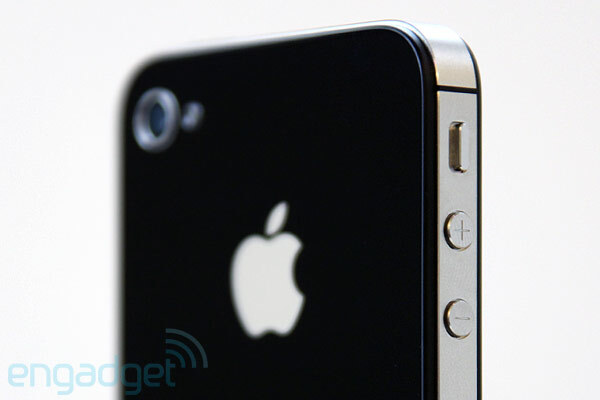 The iPhone 4S will record at 1080p30 and we found the footage to be clear and bright. Auto-focus happens quickly and we didn't detect any obnoxious focus-hunting. Overall the improvements on the camera are tangible and appreciated, but there's one thing Apple sadly failed to fix here: its location. The peep-hole for the lens is still too close to the edge of the device for our tastes, which resulted in many a stray finger sneaking into our shots. We'd have liked to see it sneak its way a little further toward the center of the phone. Is this the best iPhone yet? Yes, of course it is. The iPhone 4S takes the previous king, gives it some more pep and adds on a better camera to boot, all without really gaining any extra weight. This is, then, the best iPhone on the market, but that still leaves us with two unanswered questions: is it the best phone on the market, and is it worth the upgrade? The first question is hard to answer. If you're into iOS, have a wealth of App Store purchases you'd like to keep using and in general are down with the Apple ecosystem then, yes, this is the best phone out there. If, however, you've been shopping around, or are already tight with Android, Windows Phone, BlackBerry or Meego (hey, the N9 is pretty great) then it's hard to see this as a truly forward-looking device. The 3.5-inch display and abject lack of 4G connectivity alone make this phone feel a little too conservative to really tickle the fancy of those looking for something a bit more progressive. So, then, is it worth the upgrade? Well, if your contract happens to be up and you want an iPhone and you haven't already jumped on the iPhone 4 then yes, this is the one you want. It does come at a $100 premium over its predecessor, but in the long run that premium will be worth it as the 4S will surely be supported by Apple for a good bit longer than the 4 (as the 3GS continues to be, while the 3G is now fading into obsolescence). But, if you're mid-contract or haven't quite yet been wooed by all that iOS has to offer, we'd recommend sitting this one out. 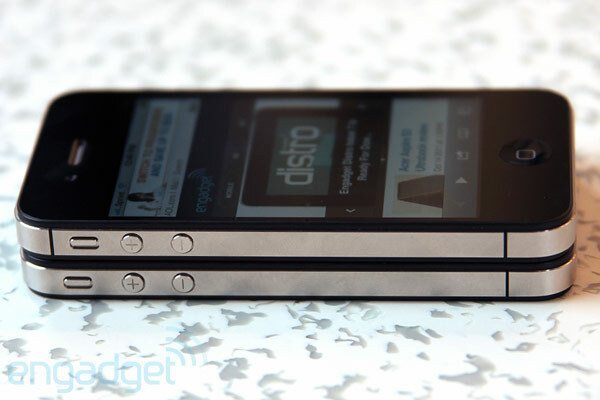 The iPhone 4S does everything better than the iPhone 4, but it simply doesn't do anything substantially different. Update: We spent a few days shooting with the iPhone 4S's eight megapixel camera, and were quite pleased with the images it was able to capture. We were slightly less impressed with the smartphone's battery life, however -- after the same shooting period, the iPhone 4 had 52 percent remaining, while the iPhone 4S had just 30 percent left. Zach Honig and Mat Smith contributed to this review.